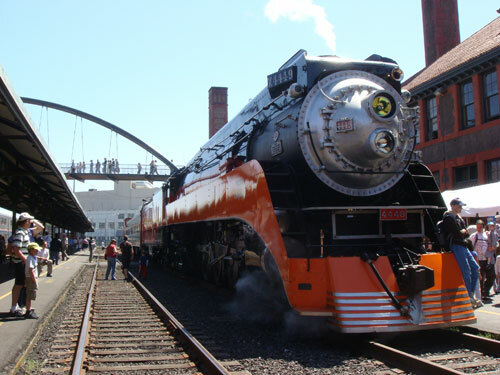 The SP 4449, built in 1941, is 110 feet long, 10 feet wide and 16 feet tall and weighs 433 tons. A 5,500 horsepower engine can push it to speeds over 100 mph. On April 24, 1958 ownership of the locomotive was officially handed over to the city in a ceremony at Portland’s Transportation Museum adjacent to Oaks Park (The Oregonian, 25-April-1958). The engine was restored in 1974 so that it could pull the 1975-1976 Bicentennial Freedom Train. [The SP 4449 is] the only remaining operable “streamlined” steam locomotive of the Art Deco era, this grand Lady of the High Iron pulled Southern Pacific “Daylight” coaches from Los Angeles to San Francisco over the scenic Coast Route and then on to Portland until 1955. She is arguably one of the most beautiful locomotives ever built — and kept that way by the all-volunteer Friends of the SP 4449. A total of three steam locomotives were donated to the city of Portland in the 1950s by railroad companies that serviced the city, the other two were the Oregon Railroad & Navigation #197 and the Spokane, Portland & Seattle #700 (Visit the website of the Oregon Rail Heritage Foundation for more information about all of these behemoths and the foundation’s efforts to build a permanent home for these historical locomotives and other rolling stock).